← Can We Get It In Four Part Harmony? It has been over ten years since the U.S. Marines departed Orange County, taking with them a huge part of our history and leaving huge pieces of contaminated land in its place. El Toro and Tustin, both Marine Corps Air Stations, were decommissioned in 1999 as part of the Base Closure and Realignment Act. Both were also turned over to local authorities to redevelop into housing and other uses. 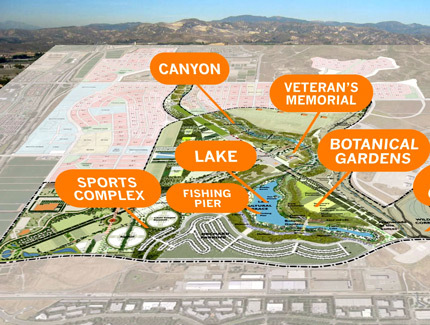 And, while Tustin largely lanquished for years due to the recession, Larry Agran and the city of Irvine had bigger plans for El Toro, including the Orange County Great Park. Billed as the, ” first great metropolitan park of the 21st Century”, the Great Park Corporation mission statement says it is preserving and protecting the Orange County Great Park for the benefit and enjoyment of all its visitors. Yet, while the mission statement is laudible, the actions of the corporation and its predecessors, particularly the Irvine City Council has been questionable. Under Larry Agran, the city council quickly wrested control of the base from the Orange County Supervisors, who had originally sought the base as an industrial airport. A park board was quickly formed with the city clearly in control with a majority vote. Contracts were issued and work begun on the park… sort of. Anyone visiting the park, ten years later, may wonder where the money went. More than $200 million dollars later, the Great Park has little to show for its efforts. An Orange helium ballon lifts visitors 400 feet above 200 or so acres of park development. A plaza of sorts plays host to a variety of events including a weekly farmers market and seasonal events for halloween and,this year, a New Years Eve bash. Yes, that is a million taxpayer dollars for every acre of park so far. The worst is, much of the development, like Hangar 244, was already there and required nothing more than refurbishment to use. And, according to the LA Times, much of the development is leased out to agriculture. The runways, left largely intact, are rented for a variety of uses, none of them parklike. Meet Ken Smith, architect of the OC Great Park. Hailed as a visionary, I remember seeing pictures of the flamboyant designer with huge oversized glasses and a comedic grin bursting onto the pages of the Register and the OC version of the LA Times. He was billed as part savior and part nutcase by those that either stood with him or against him. There were frequent photos of the Ken Smith entourage showing off plans or the occasional finished feature. The Great Park was the largest project he had ever worked on. His commanding price tag, that would eventually reach $42.7 million dollars, was matched only by his enthusiasm for the project. His lack of experience for a job this size was made up for by assembling an equally high priced group of designers and architects. Even the Great Park website billed him as “world renowned” even though he was probably the least qualified of the companies the Board interviewed. Smith quickly went to work on what was to eventually be not much more than a huge publicity stunt. Plans were developed for a 1400 acre park that would encompass sports fields fit for the children of kings (or, at least Irvinites). The big Orange helium balloon was quickly put into service and you could here the oohs and aahs from miles around as it rose high above the landscape. Scarcely a week went by when the Register or the LA Times didn’t run an article or two on the “progress” of the Great Park. The glamour has faded, though, and the reality of a state wracked in recession met the fiscal imprudence of the Great Park Board. In last year’s contentious race for the Irvine City Council, the Great Park became the football of choice for Councilmember Jeff Lalloway and what would eventually become the new majority. This month, the city council, sans Agran, voted to reduce the number of Great Park Boardmembers to the sitting city council, thereby relieving them of any further outside influence. The new, reduced, board also took immediate steps to axe the million dollar public relations firm, Forde & Mollrich as well as their lobbyist, Townsend Public Affairs. Councilwoman and former chair of the GP Board, Beth Krom, believes that is a mistake while Lalloway believes the PR and Lobbyist are unnecessary as city staff should be able to handle those tasks. Lalloway, like many in the county, is unhappy with the progress of the Great Park. The Park was not getting much in return for the $1.1 million dollars plus expenses the two firms were charging for their services each year. “We need to stop talking about building a great park and start actually working on building the great park,” Lalloway said. Lalloway has a lot of support throughout the county. Aside from some bloggers laughingly calling for a revival of the airport idea, most proponents simply want the city to stop talking about building a park and get on with actual construction. During his swearing in to the OC Board of Supervisors, 5th District Supervisor Todd Spitzer who supports Lalloway’s position said, “I’ve always been 100 percent supportive of the vision of the Great Park,” Spitzer said. “However, it’s been more than a decade and $220 million in expenditures and there’s very little to show for it.” Spitzer also challenged the new city council saying, if they couldn’t do any more than the previous council, the county should look at an initiative to turn it back to county hands. That scenario might be nice to think about but is probably undoable. After being given the reins of the Great Park years ago, the city annexed the land, making it part of the city. “It’s city of Irvine property,” Lalloway said. “The voters can’t vote to take it away from us.” Likewise, the idea of the Great Park reverting back to an industrial airport is dim since the only ones who would be able to vote on the issue would be city of Irvine residents. They, along with the residents of surrounding areas like Tustin, are not likely to warm up to that idea. Can the park be built? Surely, with the demise of Redevelopment Agencies and the loss of over a billion dollars in funding, the task is much more difficult. It is certainly time to look at alternatives, including downsizing and obtaining partnerships from developers to build something more realistic. That doesn’t mean the Great Park can’t still be. But, whatever finished product is envisioned by Lalloway and the city council, progress needs to be made. That means feet to the floor and shovels in the ground. What’s next? The Great Park will be host to the Department of Energy sponsored Solar Decatholon, a huge event to be held in October 2013. Agran believes the firing of the Great Park’s PR firm will harm the prospects of a successful event. Lalloway disagrees and plans continue for what is billed as one of the largest “green” events in the world, showcasing green technology in everyday construction. If the GP Board/Irvine City Council can pull it off (we think they can) it will be a big feather in their cap and, possibly, a portent of better days for the park that isn’t. Posted on February 1, 2013, in County Government, In the News, orange county, politics and tagged irvine city council, jeff lalloway, orange county great park, redvelopment agencies, Todd Spitzer. Bookmark the permalink. 1 Comment.